Students at Labelexpo: Daniel Amaro, Annie Chang, Patrick Cosgriff, Wyatt Dwyer, Kayla Easter, Kelsey Fields, Christine Gesell, Jared Kubatzke, Laura Lenhausen, Matt Patenaude, Maranda Teutsch, Tyler Jones, Josh Katz, Leah Kelly, Evan Ebert, Mindy Chan, Adam Wilson, Nick Carey, and Chrissy Pond. 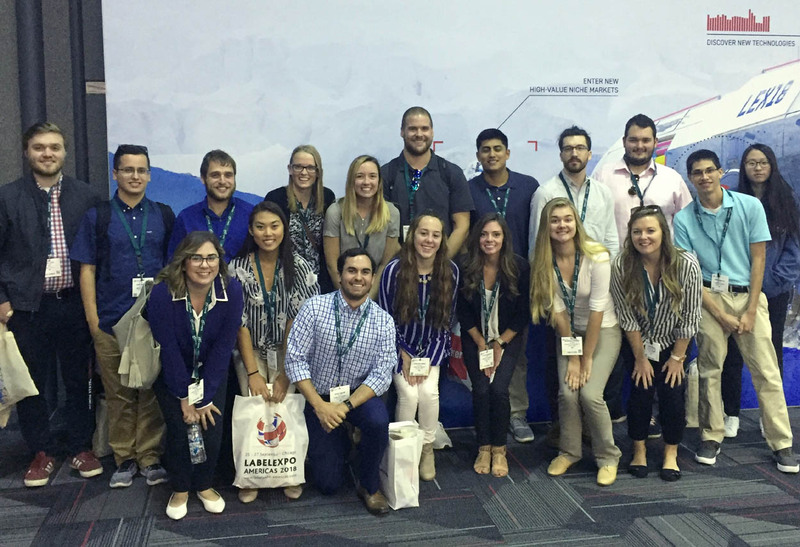 Twenty graphic communications students, along with faculty Professor of Technology Dan Wilson and Adam Burke, attended LabelExpo Americas 2018, the largest conference and convention for the label and package printing industry in North America. Students attended live demonstrations of the newest technologies, including the very latest package design software and workflows and digital presses from the world’s leading manufacturers. One student was impressed by a new cutting edge, space-saving printer which had the ability to print a textured surface by laying down different amounts of white ink onto the surface was a favorite. Students were also provided access to CEOs from dozens of companies at an evening gala hosted by OMET Americas Inc. The theme for the event was supporting the future of flexography where proceeds from the event directly benefitted the graphic communications program at Illinois State University. In total, $5,900 was donated to the program to assist students with extracurricular activities. This includes supplies for competition teams and travel funds for industry related events. Graphic Communications students in attendance were Daniel Amaro, Annie Chang, Patrick Cosgriff, Wyatt Dwyer, Kayla Easter, Kelsey Fields, Christine Gesell, Jared Kubatzke, Laura Lenhausen, Matt Patenaude, Maranda Teutsch, Tyler Jones, Josh Katz, Leah Kelly, Evan Ebert, Mindy Chan, Adam Wilson, Nick Carey, and Chrissy Pond.